Geetings Friends both Far & Near! After the festivities and celebrations through the month of January here in Panama ,we have found ourselves very busy with activities since it also marks the beginning of the rainy season. It is at this time here in the upper portion of the province where we live, that projects take on expediency- before the rains come in late April or early June. On February 1st , we traveled to see building activity for a Panamanian church in Gualaca District about one hour away. One of our contributors gave the church substantial money to build it. They held church every weekend for l4 years in the small shack in front of the large building being constructed now. This is really a blessing for them- but the pastor said “Yes, but I want my people to have the Spirit of God, not just a building-that is more important..” COTRM also gave them Sunday School supplies in December-they had none. We were able to partner with the Panamanian Ebenezer Church in Volcan who has a sister Ngabe Ebenezer church in Chame;- about an hour drive following the road out of San Felix. The event was an annual evangelistic crusade and celebration before the start of school. COTRM was able to help them with donating 15 bags of basic groceries for 15 families and 50 small bags of goodies for the children with an apple, juice, and a cookie. 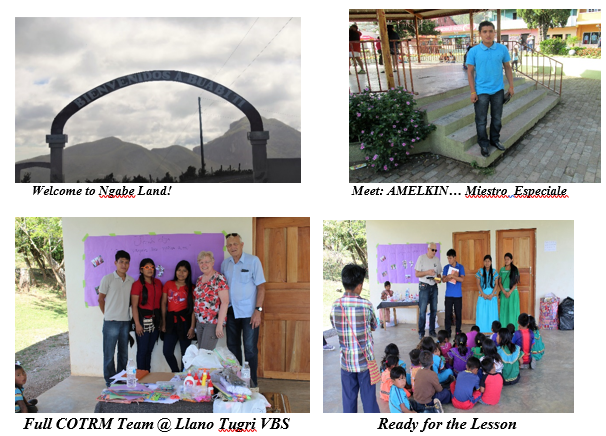 Cleft Of The Rock ministries conducted a (2) day Bible School for the children at Llano Tugri; the Ngabe Nation Capital. LLano Tugri is north of San Felix about a good hour & 30 minutes drive. If you were a bird you could get to the Caribbean in about 10 miles. The drive to Llano Tugri is majestic as you travel the mountains with steep drops off the side of the road. Most areas of the drive to not have the provisions of "guard rails" – full attention must be given as you engage all the twists and turns! And steep hills! The Bible School was a huge first for us in that area. Our efforts were rewarded through a young man by the name of Amelkin. Jane & I are personally sponsoring him at Oteima University in David City here in Chiriqui Province. He is studying English to become an English Professor one day! Amelkin was really the exact person needed for the job as he interpreted for us. The real surprise was that north of the village community area of Chame – the language is largely Gyuami by the older population. We had prepared a lot of material with Spanish translation. Fortunately, Amelkin was raised in a Gyuami language speaking family. He has mastered Spanish and now is deeply engaged in studying and learning English. He really saved the day for us, as another friend of our ministry, Arrmando, also a Ngabe, could not go at the last minute. Amelkin is proud of himself ”I know three languages now!” We also had two teenage Ngabe girls helping us, one only spoke Spanish, and the other one just a little English. They were great with the children! We really enjoyed being with them all. The theme was: Let the Little Children Come to me. ( Mark 10;13-16) and also John 3:16 to show how much Jesus loves all; whether big or small. The memory verse was Mark 10:14_ "Let the little children come to me". 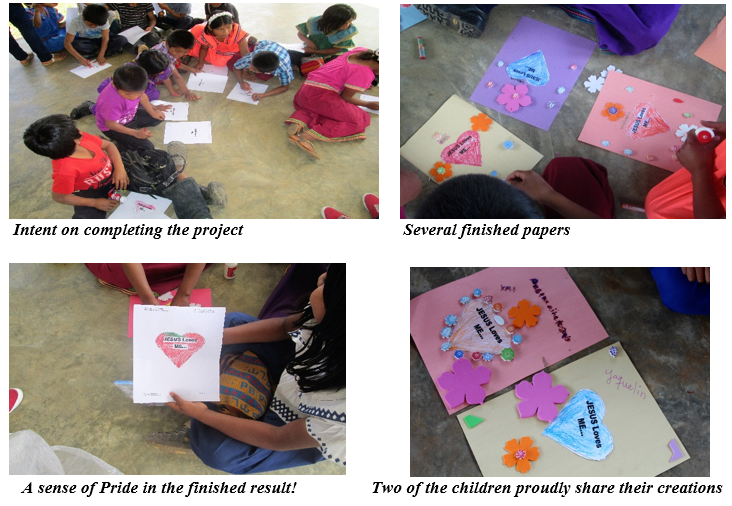 The children really enjoyed the activity time and were amazingly good with manually cutting and pasting their papers with hearts drawn on them allowing them to color and print their names on them. It cemented in their minds God's great love for us. All this without tables or chairs! We arrived at the government building where they have the after school program after overcoming many obstacles-we had to improvise at the last minute! We were ready to start , but there weren’t many children and we had sent out fliers announcing it- the Ngabes already there, and Amelkin said “ We wait- they will come” We waited, and waited- finally we said we have to start with the children that are here. They finally started to arrive- straggling in- and we ended up with 62 the first day! They have to walk to VBS-a mile or so. Following that activity, we had a large plastic bowl set on the ground outside with "paper" fish placed in there with large metal paper clips attached to their mouth. A small emergency fishing rod was equipped with a powerful magnet attached to attract the fish with the metal paper clips. As each child fished and brought up a fish; Amelkin read the Bible Saying that was printed on the fish and each child received a small plastic bag with a small reward and snack inside. We had (62) children on day one and (46) 9-12 y/o on day two. Mothers and some dads were there and observed as the children participated. There were 128 all together. We are contemplating an adult class for next year. We traveled back & forth to Llano Tugri both days and lodged each evening at the Jesuit Mission, (Fundacion Nuestra Senora Del Camino) in San Felix. We really were blessed by their hospitality: bed, showers and meals each day. The ending of VBS presented an opportunity for COTRM to present a gift to the mothers with children 15 months of age and less through COTRM’s Baby Blessings program. The packages included a baby quilt (made by our Ladies Sewing Circle at Birch Grove Mennonite church in Penna. ),small stuffed toy, a large tube of hand lotion for the “Mamas”, and a Gospel Tract for the women in Spanish “You are Special”. We were blessed to be able to put (12) of these packages into the hands of very appreciative mothers. March 2017 The Water Well Project is waiting for some final touches of the Contract and we hope to sign it at the Well Drilling Company April 10th! We were anticipating being able to drill near the end of March but have to wait our turn as the drilling company has a list to follow. There will no doubt be some miscellaneous expenses at the Service Point once finished. So we may need some extra funding for it. WOULD YOU LIKE TO MAKE A NGABE CHILD’S DAY? We have two feeding programs for the Ngabe children. One is in Llano Tugri- way up in the mountains near San Felix- (actually 1.5 hours from San Felix) which we started in December, 2016. It is an afterschool program also for the children to aid in helping them with their education. The children only go to school for half a day and this program reinforces their learning. Being so far up in the mountains, there is not as much help for the Ngobes in that area of the comarca as more accessible areas. The other program is in the San Felix, Oma area. -The Tabernacle of Adoration church’s children’s feeding program. We took over the San Felix children’s feeding program last year due to the previous sponsor not being able to provide for them temporarily, after years of feeding them. We have discovered that the previous group is unable to resume the feeding program at all. We would like to continue it for the children. They also have an afterschool program to help the children in the community. Oma is one of the poorest areas on the Comarca according to a Ngobe friend of ours. For some of the children, it was their only good meal of the day. We have a need for ongoing monthly donors who could help finance these programs. Five (5) individuals or groups that would be able to donate $ 50.00 each month to the two Children’s Feeding Programs that are part of our Ministry. The money that is donated to this cause will be placed in Restricted Funds used specifically for these two programs. If you or your group would be able to support Cleft of The Rock Ministries in these two Feeding Programs- we would be so appreciative and blessed to continue the programs. 35 Galilee Street Falling Waters, WV 25419. The contribution will be deposited to our Cleft Of The Rock Ministries account. You can also pick the phone and dial 304-551-8930 and reach us with your decision in Panama or the USA. Another need that we have is for a group of about (4) persons to add a “wind break” to a side of the Feeding Shelter and also refinish (steel wool and varnish) Eight Picnic Tables at the Feeding Shelter. If this is a mission type trip your group would like to undertake; we can work out details! Extent of our Ministry Outreach in which we find ourselves involved! Your Financial and Prayer support are greatly appreciated! May you be blessed as you enter into the season called “Spring” with evidence of new life spouting up all around. Rejoicing too in a Risen Lord & Saviour.